The French grunt at center and the sea fan at rear attract the eye in this photo of a small islet of life in a sand flat off Utila Island, Honduras. In fact, there are at least 10 obvious species of animals in the photo, including corals, gorgonians, sponges and fishes, not counting crustaceans and worms likely hidden in the crevices and sand. Or species of algae. HERE IS ONE REASON I LOVE THE UNDERWATER WORLD: Coral reefs are rightly compared to rainforests for their astonishing diversity of life but reefs are more just than settings where living creatures are abundant. On reefs, virtually everything represents a living plant or animal, constructed by them and of them – even the sand. They’re beautiful, fascinating, instructive. In fact, they’re also a roadmap to life’s earliest origins. RETHINK “ANIMALS” It’s true that you have to extend your understanding of the concept of “animal” beyond the fishes, octopuses and other free-swimmers that demand our attention in any undersea scene, even beyond the crabs and shrimps hiding here and there. In the sea, “animal” embraces multitudes of organisms that are unlikely in a terrestrial sense. Consider the tiny animals that join together to make up living structures of star and brain corals, sea fans and sea plumes. It’s a sea plume, not a stony coral head, but it’s a colony of polyps all the same. They’re all communities of miniscule cnidarian polyps, animals that make their living by building common colonial structures from which they can filter microscopic food stuffs from the surrounding water (See “Corals & Gorgonians” menu). ALTERNATIVE LIFESTYLES When you look at stony coral, you see the hard, external skeleton – a single, broad layer of living polyps only millimeters thick – created by the animals within them. It’s a stratum of little cup-shaped corallites, or shells, laid upon the old carbonate structures of those that lived before them, sometimes hundreds, even thousands of years before. Corals build their corallites by processing calcium from the waters about them. Ostensibly, they find nourishment by extending their fragile tentacles out of those shells into the current and capturing passing plankton (actually, they get most of their nutrition from the symbiotic zooxanthellae algae that live within their tissues). 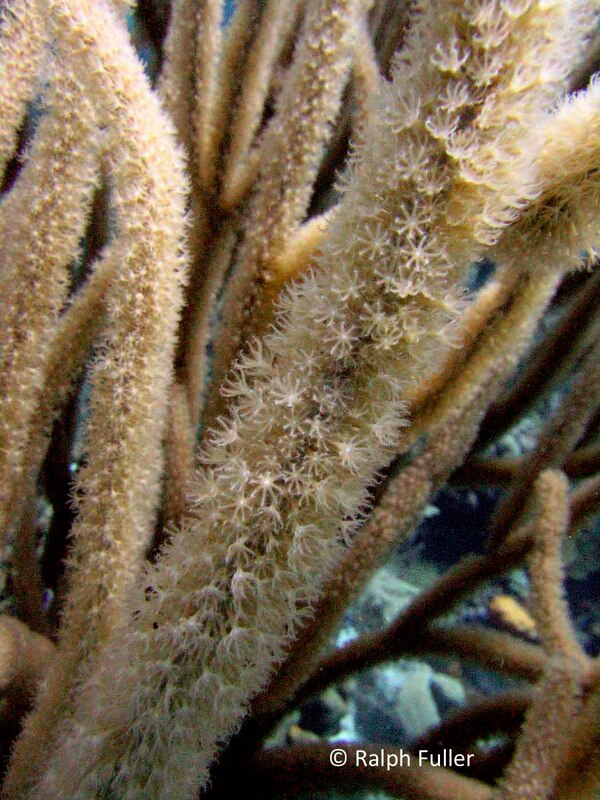 Bushy sea rods and flattened sea fans are similar polyps with different strategies. They build their colonies not with calcaric exoskeletons but along stems of hard protein – something like your fingernails – that place them right in the midst of the current’s flow. AN APPRECIATION OF ALGAE Underwater, the definition of “plant” broadens as well. The word “plant” is routinely used in discussing reef life but there are very few pure plants as we know them on shore. MORTAR Encrusting coralline red algae, here photographed on the Great Barrier Reef, is the “cement” that holds reef parts together. In the oceans it’s more likely to refer to the enormous range of algae that have plant-like appearances – whether the scummy green stuff that makes rocks slippery in the tidal zone, the brown Sargasso seaweed that drifts in on the currents throughout the major oceans or the giant kelp forests of California. Technically they’re classified as part of the Protista Kingdom, separate from plants and animals, with characteristics of each. A DYNAMIC PROCESS A coral reef is a dynamic equation, continually being built up as its members grow and torn down as they compete for space and nourishment. 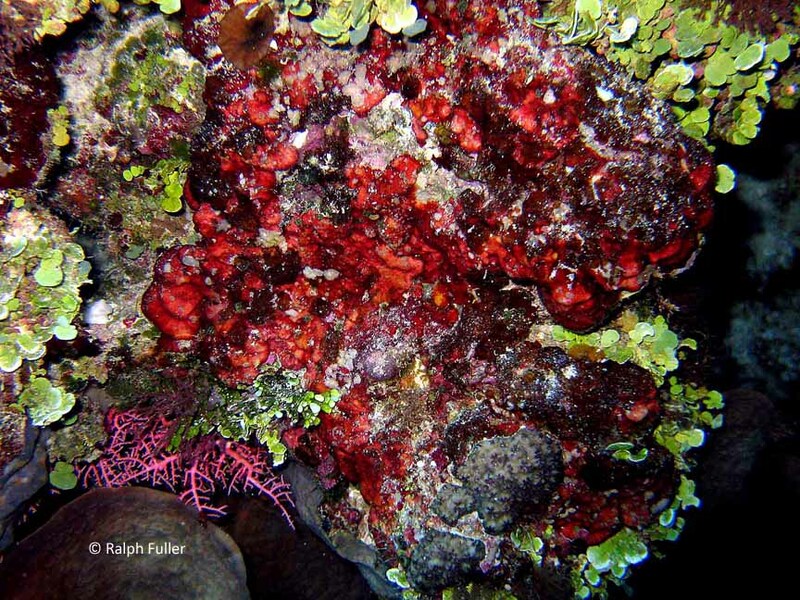 Some algae – especially encrusting red coralline algae – constitute the underlying “mortar” of the reef, filling in cracks and crevices and cementing the pieces together into unified solid structures. 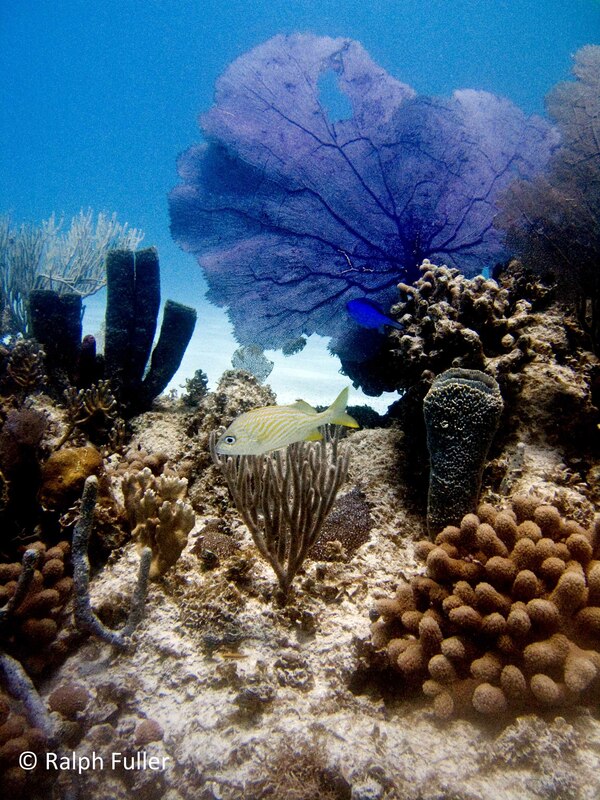 Corals and other animals seek access to both solar energy and the water currents that carry food. They also compete with each other, growing over and atop one another, blocking access to sunlight. Snails, sponges and worms bore into coral for food and living space (and sometimes other animals move into abandoned holes). Butterflyfishes with pointed snouts pluck polyps out of their corallites, leaving behind only their calcium carbonate shells (“dead coral” is actually the empty calcareous shells of animals that are no longer there). The surges of ocean storms break reef structures and grind them down. Some animals, especially parrotfishes, make it their life’s work to seek out algae growing on and in coral. Parrotfishes’ beak-like jaws are adapted for gnawing on the hard exoskeletons to get at the algae within. But in their quest, they often ingest the calcium carbonate of the skeletons as well, using special teeth in their throats to grind it into tiny grains that can be handled by the digestive tract. 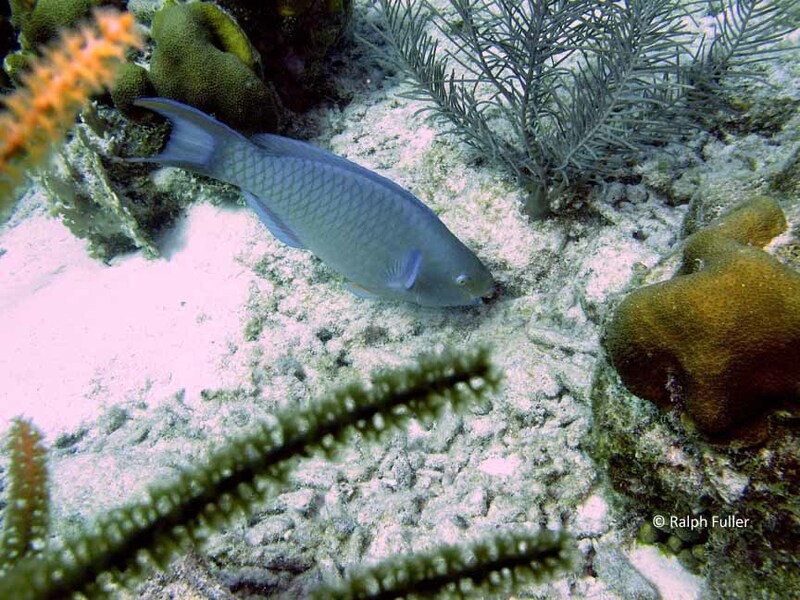 It’s true – parrotfishes poop out sand, a very fine-grained form of it.